The Dfos/kayak gene encodes a bZIP protein, DFos, required in a large variety of differentiation and morphogenetic processes throughout Drosophila development. Fos and Jun proteins homo- or heterodimerize to form functional AP-1 transcription factor. Mutation in these genes cause phenotypic mutations in Drosophila. Drosophila mutants lacking either Jun or Fos display indistinguishable dorsal open phenotypes, indicating an essential function of both Jun and Fos for embryonic dorsal closure (1). Phenotypic analysis of these mutants reveals that homodimers of Fos or of Jun cannot replace the function of the heterodimeric complex. This defect is not explained by the lower stability of homodimers as compared to heterodimers, because ’pseudo-homodimers’ which are as stable as native Jun-Fos heterodimers cannot substitute for their function. Thus Jun and Fos play complementary roles that are both required for signal transduction and gene activation during dorsal closure. AP-1 transcription factor Dfos and Forkhead Box O transcription factor Foxo are also required downstream of Jun-N-terminal kinase signaling for the apoptotic response to UV-induced DNA damage in the developing Drosophila retina (2). Activation of JNK pathway is also involved along with puckered (puc) expression in wound healing of D. melanogaster wing imaginal disc wound healing and dorsal closure, the cells of the epidermis activates the AP-1 transcription factor comprised of DJUN and DFOS that, in turn, upregulates the expression of the dpp gene. stage-specific steroid-triggered programmed cell death of larval tissues during Drosophila metamorphosis induce the expression of several key genes of Rel/NF-Kappa B and AP-1 (3). Dfos is induced in a stage-specific manner, immediately before this tissue is destroyed while Djun is expressed for many hours before salivary gland cell death (3). Spatial and temporal regulation of the JNK signaling cascade may be a general mechanism that controls tissue remodeling during morphogenesis and wound healing. Djun and Dfos mRNA are continuously expressed and their abundance levels are transiently regulated by multiple signaling pathways, the peak response coming at 1-2 hours after perturbation. Djun and Dfos, the products of the Drosophila proto-oncongenes Djun and Dfos, are similar in size and sequence to their mammalian counterparts c-Jun and c-Fos and are related to their mammalian counterparts by their antigenic properties. The Dfos is more highly regulated than Djun which is only modulated. The receptor tyrosine kinase pathways positively regulate Dfos and Djun. The cAMP-mediated pathway positively regulates Dfos but negatively regulates Djun. The protein kinase C-activated pathway does not affect Djun whereas it negatively regulates Dfos (4). Immunofluorescence staining of human 3rd instant ventral ganglion with kay polyclonal antibody ( Cat # PAB8948 ). Antibody dilution as 1:250. 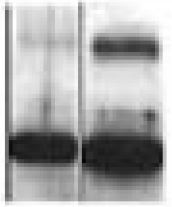 Western Blot using D-Fos antibody Cat.-No AP09973PU-N (left lane) and AP09974PU-N (right lane). Western Blot using D-Fos antibody Cat.-No AP09974PU-N (right lane) and AP09973PU-N (left lane). IHC-P analysis of D. melanogaster using Drosophila Fos antibody at a dilution of 1:200. 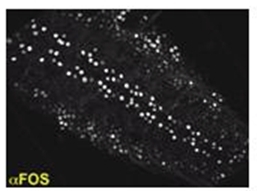 WB analysis of PC-Dfos using Drosophila Fos antibody at a dilution of 1:500.